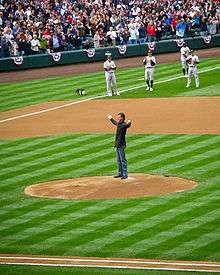 Randall David "Randy" Johnson (born September 10, 1963), nicknamed "The Big Unit", is an American left-handed former pitcher who played from 1988 to 2009 for six teams in Major League Baseball, primarily the Seattle Mariners and Arizona Diamondbacks. His 303 career victories rank as the fifth-most by a lefthander in major league history, while his 4,875 strikeouts place him second all-time behind Nolan Ryan and are the most by a lefthander. He holds five of the seven highest single-season strikeout totals by a lefthander in modern history. Johnson won the Cy Young Award five times, second only to Roger Clemens' seven; he is one of two pitchers to win the award four consecutive times (1999–2002), and in 1999 joined Pedro Martínez and Gaylord Perry in the rare feat of winning the award in both the American and National Leagues. He is also one of five pitchers to pitch no-hitters in both leagues; with the second no-hitter, in 2004, he became the oldest pitcher in major league history to throw a perfect game. He is one of the few pitchers in history to record a win against all 30 MLB franchises. One of the tallest players in major league history at 6 feet 10 inches (2.08 m) and a ten-time All-Star, Johnson was celebrated for having one of the most dominant fastballs in the game; he regularly approached – and occasionally exceeded – 100 miles per hour (160 km/h) during his prime. He also threw a hard, biting slider. After struggling early in his career, gaining only 64 wins by his 30th birthday, he went on to lead his league in strikeouts nine times, and in earned run average, winning percentage and complete games four times each. Johnson was named co-MVP of the 2001 World Series, leading the Diamondbacks to a championship in only their fourth year of play. His .646 career winning percentage ranks sixth among lefthanders with at least 200 decisions, and among southpaws he ranks eighth in games started (603) and ninth in innings pitched (4,135 1/3). He also finished his career first in strikeouts per nine innings pitched (10.67), third in hit batsmen (188), and tenth in fewest hits allowed per nine innings pitched (7.24). He was elected to the Baseball Hall of Fame in 2015, his first year of eligibility, and is the first member of the Hall to be depicted in a Diamondbacks uniform on his plaque. Johnson was born in Walnut Creek, California, to Carol Hannah and Rollen Charles "Bud" Johnson. By the time he entered Livermore High School, he was a star in baseball and basketball. In 1982, as a senior, he struck out 121 batters in 66 innings, and threw a perfect game in his last high school start. He also played on a Bercovich team that assembled top players from throughout California. After high school he was drafted in 1982 by the Atlanta Braves in the 4th round and offered $50,000 to sign. Instead, Johnson accepted a full athletic scholarship to the University of Southern California, also playing 2 years of basketball. He continued to start at USC (where he was a teammate of Mark McGwire) under coach Rod Dedeaux, but often exhibited control problems. Johnson was drafted by the Montreal Expos in the second round of the 1985 Major League Baseball draft. He made his major league debut on September 15, 1988 against the Pittsburgh Pirates, earning a 9–4 victory with a five-inning outing in which he gave up two runs with five strikeouts; his first victim was Orestes Destrade in the second inning. Johnson posted a record of 3–0 with a 2.42 earned run average (ERA) in four games in 1988, but 1989 saw him slip to an 0–4 mark with a 6.67 ERA in seven games through May 7, and on May 25 he was traded to the Seattle Mariners in a trade involving five pitchers that brought Mark Langston to Montreal. Johnson broke out in 1993 with a 19–8 record, 3.24 ERA and his first of six 300-plus strikeout seasons (308). In May 1993, Johnson again lost a no-hitter to a 9th-inning single; again, the opponent was the Oakland Athletics. He also recorded his 1,000th career strikeout against the Minnesota Twins' Chuck Knoblauch. Prior to the trade deadline, Johnson was nearly dealt to the Toronto Blue Jays for Steve Karsay and Mike Timlin. Toronto general manager Pat Gillick had two separate transactions on the table including the one for Johnson with Seattle general manager Woody Woodward and one for Rickey Henderson with Oakland general manager Sandy Alderson. When Gillick was unable to contact Woodward he agreed to utilize the deal with Alderson. When Woodward returned Gillick's call he said he would agree to the deal for Johnson. However, Gillick gave his word to Alderson even though the deal had not been finalized. At the 1993 All-Star Game in Baltimore, Maryland, in a famous incident, Johnson threw a fastball over the head of Philadelphia Phillies first baseman John Kruk. A similar incident would occur with Larry Walker in the 1997 All-Star Game. Johnson capped the Mariners' late season comeback by pitching a 3-hitter in the AL West's one-game playoff, crushing the California Angels' hopes with 12 strikeouts. 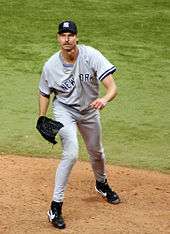 Thus unable to start in the 5-game ALDS series against the Yankees until the third game, Johnson watched as New York took a 2–0 series lead. Johnson beat the Yankees in Game 3 with 10 strikeouts in 7 innings. When the series went the full five games, the Mariners having come back from an 0–2 deficit to win both games at the Kingdome, Johnson made a dramatic relief appearance in the series final, Game 5, on only one day's rest. Entering a 4–4 game in the ninth inning, Johnson pitched the 9th, 10th, and 11th innings. He allowed 1 run, struck out 6, and held on for the series-ending win in Seattle's dramatic comeback. 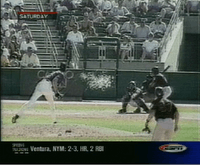 In a freak accident on March 24, 2001, during the 7th inning of a spring training game against the San Francisco Giants, Johnson threw a fastball to Calvin Murray that struck and killed a dove. The bird swooped across the infield just as Johnson was releasing the ball. After being struck, the bird fell amid a "sea of feathers." The official call was "no pitch." On May 18, 2004, Johnson pitched the 17th perfect game in baseball history. At 40 years of age, he was the oldest pitcher to accomplish this feat. Johnson had 13 strikeouts on his way to a 2–0 defeat of the Atlanta Braves. The perfect game made him the fifth pitcher in Major League history (after Cy Young, Jim Bunning, Nolan Ryan, and Hideo Nomo) to pitch a no-hitter in both leagues. Johnson struck out Jeff Cirillo of the San Diego Padres on June 29, 2004 to become only the fourth MLB player to reach 4,000 strikeouts in a career. After an inconclusive year in pinstripes, New York fans hoped that Johnson would return to his dominant style in his second Yankee season. Johnson began 2006 well, but then he struggled to find form. In between some impressive performances, he allowed 5 or more runs in 7 of his first 18 starts for the season. Johnson was more effective in the second half. Johnson finished the season with a 17–11 record, a subpar 5.00 ERA with 172 strikeouts. It had been revealed at the end of the 2006 season that a herniated disc in Johnson's back had been stiffening him and it was only in his second to last start of the season that he decided to get it checked. This exposure had caused him to miss his last start of 2006. After being given epidural anesthesia and a few bullpen sessions he was cleared to start in game 3 of the ALDS, however he gave up 5 runs in 5 2⁄3 innings. In January 2007, the Yankees traded Johnson back to the Diamondbacks, almost two years to the day that Arizona had traded him to New York, for a package of Luis Vizcaíno, Alberto González, Steven Jackson, and Ross Ohlendorf. The Yankees' decision to trade Johnson was primarily based on his pre-season request to be traded after the death of his brother. Yankees General Manager Brian Cashman was very sympathetic to Johnson's grief and agreed to trade him back to the Diamondbacks so that Johnson could be closer to his family in Phoenix. In the prime of his career, Johnson's fastball was sometimes clocked over 100 mph (160 km/h), even as high as 102 mph (164 km/h) with a low three-quarters delivery (nearly sidearm). His signature pitch was a slider that broke down and away from left-handed hitters and down and in to right-handed hitters. The effectiveness of the pitch is marked by its velocity being in the low 90s along with tight late break; hitters often believe they were thrown a fastball until the ball breaks just before it crosses home plate. Right-handed hitters have swung through and missed sliders that nearly hit their back foot. Johnson dubbed his slider "Mr. Snappy". In later years, his fastball declined to the 96 mph (154 km/h) range and his slider clocked at around 87 mph (140 km/h). Johnson also threw a split-finger fastball that behaved like a change-up and a sinker to induce ground-ball outs. In a June 27, 2012, appearance on The Dan Patrick Show, Adam Dunn (a left-handed batter) was asked who the best pitcher he faced was. "Honestly, Randy Johnson when he was good. It's hopeless. It's like a hopeless feeling. The first time you face him you feel like he's going to hit you right in the back of the neck when he throws it, like every pitch is going to hit you in the back of the neck. And it ends up down and away for a strike and you just have to trust it's going to be a strike, and heaven forbid he doesn't lose one out there and heaven forbid, there goes your cheek." Johnson guest starred in The Simpsons episode "Bart Has Two Mommies", which aired on March 19, 2006. Johnson appeared in the movie Little Big League, playing himself. Johnson also made an appearance in the hit baseball film, "Major League 2". ↑ "Randy Johnson Biography". JockBio. 1963-09-10. Retrieved 2012-07-18. 1 2 "Randy Johnson Statistics and History". Baseball-Reference.com. Retrieved 2012-07-18. ↑ "The Warren Spahn Award". Okcspahnawards.com. Retrieved 2012-07-18. ↑ "The Official Site of Major League Baseball: Official info: Umpires: Feature". Mlb.mlb.com. 2012-06-19. Retrieved 2012-07-18. ↑ Associated, The (2008-03-09). "Hideki Matsui returns to Yankees' lineup; Randy Johnson ready for spring debut". Usatoday.Com. Retrieved 2012-07-18. ↑ "Randy "Big Unit" Johnson vs. Roger Clemens". CBSSports.com. Retrieved 2012-07-18. ↑ "D-backs fall on Johnson's historic night | MLB.com: News". Arizona.diamondbacks.mlb.com. 2012-06-19. Retrieved 2012-07-18. 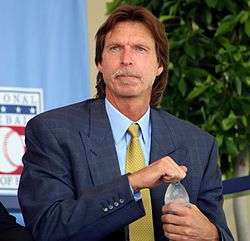 ↑ "Giants sign free-agent pitcher Randy Johnson to one-year deal". MLB.com. 2008-12-26. Retrieved 2009-09-14. ↑ Haft, Chris (2008-12-26). "Giants sign Big Unit to one-year deal". MLB.com. Retrieved 2009-09-14. ↑ "Giants Activate Randy Johnson to Pitch Out of Bullpen". fanhouse.com. Retrieved 2009-09-16. ↑ "MLB Gameday". Retrieved 2014-10-27. ↑ Ortiz, Jorge L. (2009-06-01). "At 45 years old, Randy Johnson is still fired up". USA Today. Retrieved 2012-07-18. ↑ "Baseball Hall of Fame: Johnson, Martinez, Smoltz, Biggio elected". CBSSports. Retrieved January 6, 2015. ↑ "Fastball clocked as high as 103 mph". Hypertextbook.com. Retrieved 2012-07-18. ↑ Verducci, Tom (May 16, 2006). "Showing his age: Johnson's woes reveal his best days are behind him". Sports Illustrated. Retrieved November 30, 2011. ↑ Lewin, Josh (May 4, 2005). "El Meteoro? Not quite the same ring as Twinkletoes". Sporting News. Retrieved October 9, 2007. ↑ "Randy Johnson Scouting Report". Feeds.foxsports.com. Retrieved 2012-07-18. 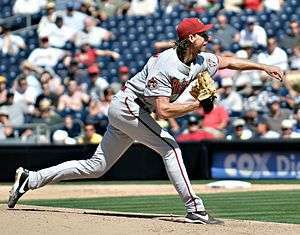 ↑ "Randy Johnson House Pictures". CelebrityHousePictures.com. Retrieved 2012-07-18. ↑ "Randy Johnson Photography". rj51photos.com. Retrieved 2016-04-11. ↑ "Randy Johnson, Big Man in Seattle". Sports Spectrum. Retrieved 2016-04-11. ↑ Santasiere, Alfred; Haley Swindal; Quentin Washington (2005-05-27). "Big beginnings for the Big Unit". MLB Advanced Media, L.P. Retrieved 2007-06-18. ↑ "Commercials". GEICO. 2010-12-14. Retrieved 2012-07-18.